FOUR YEARS AS A MEMBER OF THE SECRET RECIPE CLUB! The night before baking day, mix the soaker and poolish in separate bowls. Cover both bowls with plastic wrap. Leave enough room in the poolish bowl for it to double in size. The next day (about 12 to 16 hours later), measure the 278 grams of water into a large bowl or dough rising bucket. Add the poolish, and mix it into the water with your hand to break it apart. Add the flours, salt, and yeast, and mix the dough with your hands, stirring, pinching, and folding the dough to absorb all of the flour and dissolve the salt and yeast. When you pinch the dough, you should not feel any grit. Once all of the ingredients are combined, mix in the soaker with your hand until evenly distributed. Add the dates, and mix to distribute. Cover the bowl with plastic wrap and let rise in a warm spot. After 45 minutes, stretch and fold the dough over itself from all four “sides.” Repeat the 45 minute rest followed by a stretch-and-fold two more times (a total of 3 stretch-and-folds). Let the dough rest for a final 45 minutes, covered, in a warm spot. Scrape the dough out onto a lightly floured counter, and gently nudge it into a rectangle. Be careful not to deflate the dough. Using an oiled bench knife, cut the dough into three equal pieces. Pick each piece up with floured hands and place it on a floured couche or parchment lined baking sheet. Cover with the rest of the couche or oiled plastic wrap. Let the dough rest for 20 minutes, while you heat the oven to 475 degrees F, and set it up with a steam pan on the lowest rack and a baking stone directly above it. Fill a spray bottle with water. When the oven is at the correct temperature, transfer the loaves to the baking stone (see notes above, or place the baking sheet with the loaves on it in the oven). Place a cup of boiling water in the steam pan (cover your oven’s window), and spray the oven walls with water. Quickly close the door. Bake the loaves for 25 to 30 minutes, rotating halfway through. They are done when the internal temperature reaches 200 to 210 degrees F. Cool on a wire rack. Comments: I made this bread in one of those perfect Saturdays! Why? Because I woke up before 5am feeling super energetic, could hardly wait to get downstairs and play with my ingredients already measured since the evening before. During the first 45 minutes rise I did a nice P90X yoga while the house was still dark, peaceful and silent… As in a perfectly timed symphony, just as I finished my exercises, Phil woke up and made me a fantastic cappuccino…. the dogs immediately joined us in welcoming the weekend…Told ya: perfect Saturday! Back to Karen’s ciabatta: the dough was a pleasure to work with, gaining strength at each folding cycle. In the composite photo above, the dough is shown after the last folding cycle, all plump and shiny. I used whole flaxseeds, Karen used ground, but I followed the exact same method, including the volume of water to make the soaker. You can use whatever type of flaxseeds you have in your pantry. Most important thing is not to deflate the dough too much as you coach it into the ciabatta shape. The less you mess with it, the better. You will be rewarded with a ton of holes, a very airy bread, comme il faut. We both loved this bread! The dates offer a burst of sweetness that plays well with the almost sour nature of the dough given by the extended fermentation of the poolish. Cut a slice, toast it very very lightly, top it with some Gorgonzola and you will have to tie yourself to your seat not to fly away in a magic carpet…. Awesome combo. And now, for the bonus recipe from Karen’s site… Adorable meatloaves in individual servings. Her recipe used beef, I changed it slightly by using ground turkey. Spray a half sheet pan with spray oil and heat the oven to 400 degrees F. In a food processor, pulse the shallot, celery, parsley, and bacon several times until well chopped. In a large bowl, combine the oats and boiling water and stir. Add the mixture from the food processor and combine. Break up the ground turkey and pork and add them to the large bowl. Whisk the eggs and add them to the meat and oat mixture. Sprinkle with the salt and pepper. Add 1/4 cup of the chili sauce to the meat mixture. Mix with your hands until everything is well mixed. Divide the mixture into four equal parts and shape each into a small loaf, placing them onto the baking sheet. Take 1/2 cup of the chili sauce, and brush it over the four loaves. Bake the loaves on the center rack for about 25 minutes. Remove the pan from the oven and brush the loaves with the rest (1/4 cup) of the chili sauce. Turn on the broiler, and place the pan back on the center rack. Broil for about 5 minutes, until the chili sauce just begins to brown. These meatloaves were sooooo good! The chili sauce is a must, do not skip it. They turned out moist, flavorful, spicy but not overly so. I served them with sweet potato noodles that were recently published in my guest post over at Foodbod. The recipe made 3 loaves and we enjoyed them for dinner, then I had leftovers for my lunch a couple of days in a row. Heaven. Just heaven. If I may make a public confession, I had some slices straight from the fridge. Cold. Yeah, standing up, with a Jack Russell staring at me wondering how long it would take for Newton’s Law of Gravity to work its magic in his favor. HA! Not a chance! OMG Sally. I am crying. Tears of happiness because I am so touched by this. I don’t even know what to say. I will say that I’m doing a happy dance because I remember you said the same thing when I had your blog and did the Tartine bread. Yes, I do remember my dear friend. So that I don’t get too emotional, let’s talk grandkids. This weekend, when I was taking my 7 year old grandson to the outhouse to poop during his brother’s soccer game, he told me how impressed he was with my ability to walk faster than he does. Okay… I’m now composed. And… you are the sweetest ever! Have a WONDERFUL Reveal Day, Karen!!!! It’s already wonderful Sally!! Enjoy that baby. She’s gorgeous. Spoil her. That’s what we grandmas do! Even though I don’t like Meryl Streep, your loaves are beautiful. Love this bread so much! Can you tell me what is the difference between the wild yeast and the poolish? Which is the best? Thanks! Wow! I’m super impressed that you made ciabatta bread and that Karen has 247 bread recipes on her blog! Your bread looks perfect (not that I’m a good judge as I’m not a bread maker) and adding dates sounds like a fabulous idea. Such a fantastic post!! Love it all – both of your choices look marvelous. That bread is gorgeous!! 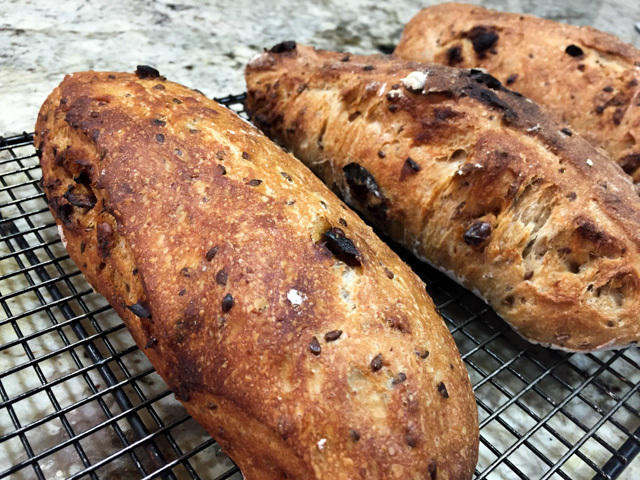 Karen has so many fantastic breads in her site, it is very hard to decide what to make…. but I’m glad I went with these ciabattas, the addition of dates was superb! Loved it that you got my blog! Makes this month simply PERFECT! Just stopping in from group C to say this bread looks great. I love bread as well and I know I’ll have to check out Karen’s blog for all of her great bread recipes. I just clicked on the link for her Tangzhong bread and it looks so good. Wonderful looking flax seed loaves. I’ll have to try this next time. Great to see you from Group C, what great honor!!!!! Yes indeed her breads are amazing…. What an awesome SRC post! This is exactly why I love the SRC community so much – look at the love and excitement and happiness in this post! And it goes without saying that that ciabatta looks amazing, as do those mini meatloaves. Perfect choices for this month’s SRC! Well, you said it all – to me, the SRC is a fantastic virtual event, in which great bonds are formed… you know, I will switch groups soon, but I guess after 4 years it will be nice to interact with another group of food bloggers – the bonds made in group D will not change! I’ve been thinking of you soaking up little Greenlee! I know you’ve been so excited to get out there. I hope you have had an amazing visit (how could you not with those big sweet eyes of hers!). And your perfect Saturday sounds absolutely wonderful. I love when weekend mornings present themselves so perfectly. Those days are meant to be savored! Your ciabatta looks AMAZING! I bet it tasted fantasic. And those little meatloaves are adorable. I haven’t had meatloaf in ages. I agree, that is the perfect Saturday. How do you time it so well? (especially the cappuccino). Loving these two recipes from Meryl (I mean Karen!) surpassed only by her grandson poop story in the comment section. She’s my kind of gal 😉 . You aren’t kidding that you had a perfect Saturday morning Sally. This bread looks delicious and I love the addition of the chili sauce to the meatloaf. I absolutely love a Saturday that involves nice baking and exercises – they complement each other well, don’t you think? And there’s just something about a yoga session in total silence… cannot beat that! Jackpot! Yes, you may feel like you’ve won the lottery but we are the ones with whom you’ve shared the winnings. We got 2 new recipes and I learned of a new, fantastic blog. I cannot remember when I’ve seen a ciabatta loaf with a crumb so nice. I need to get my starter going and start playing. Winter is fast approaching and there’s no better time to play around with bread dough. Thanks for the inspiration, Sally. Two recipes means double the goodness. Both look like winners. Happy Reveal Day! Wow! This surely must have been a perfect weekend for you. I would love to bake this long weekend. Happy thanksgiving! Love Karen’s blog! Your bread looks amazing! And that meatloaf too! Such great picks. Even though I don’t like meatloaf (it’s a texture thing), that bread looks glorious!